I don’t eat too many meatless meals, but when I do they usually involve lots of cheese or cream. Hello pizza and fettuccine! Thank heavens for dairy and that I’m not allergic or intolerant. Seriously, I barely go a meal without some kind of dairy product. 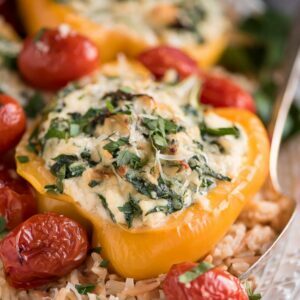 If you like cheese as much as I do then you’ll love these Spinach Ricotta Stuffed Peppers! 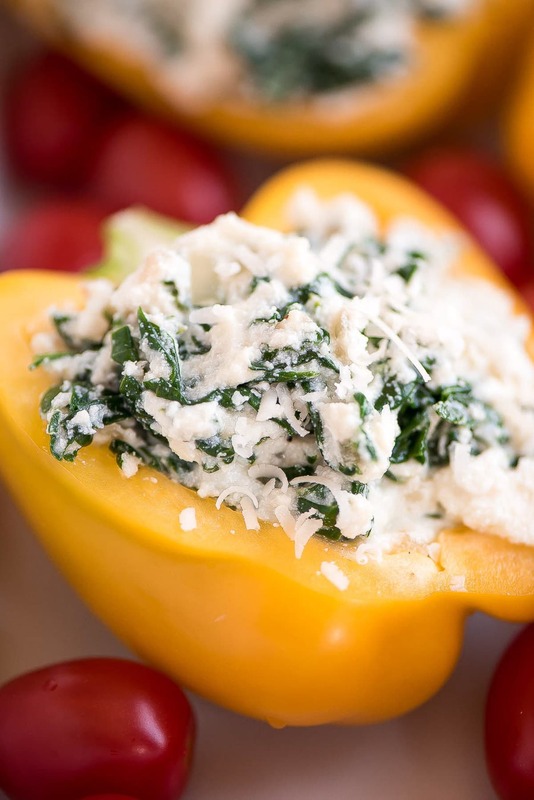 The peppers are jam packed with sautéed onion, garlic, and spinach, plus ricotta and parmesan cheese! I can assure you each bite is so full of flavor. This recipe is SO easy… And the peppers themselves only require a handful of ingredients! For the filling, just cook up some onions and garlic, wilt the spinach, season, and then mix it with the ricotta and Parmesan cheese. Then you stuff that mixture into each pepper half. Toss the tomatoes into the 9×13 pan. Drizzle with a little olive oil and then salt and pepper. Arrange the stuffed peppers in the pan with the tomatoes and then bake away! Meanwhile, make your grain. What’s your go-to grain? Quinoa, rice, orzo? I really enjoyed these peppers with Orzo Rice. You just toast the orzo in butter until golden and then add some rice and proceed as you would normally cook rice. So good! 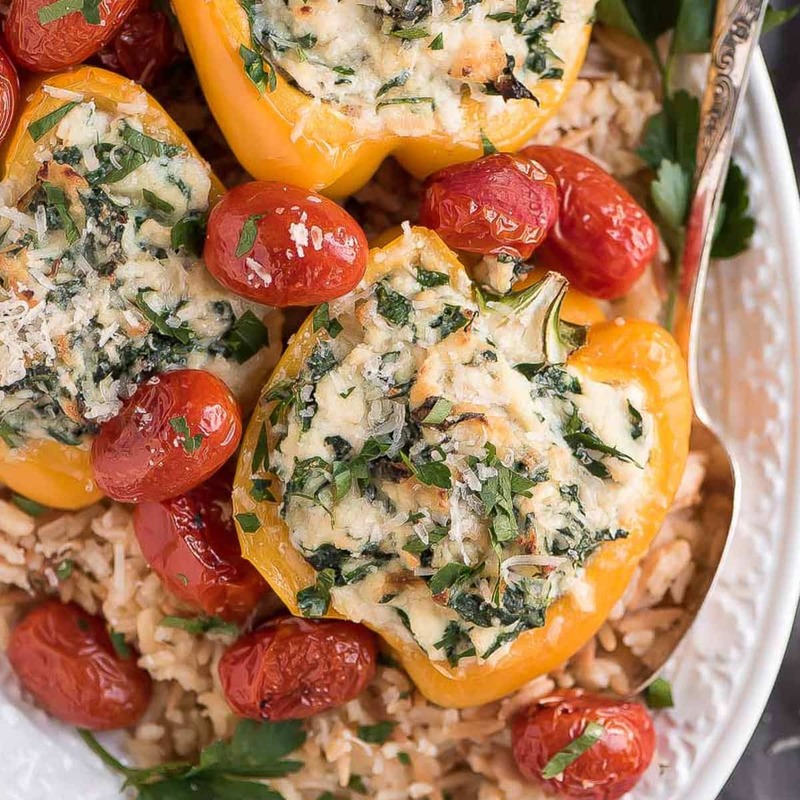 These stuffed peppers are so flavorful and cheesy and way too easy to throw together. I have a feeling I’m going to be making these a lot more this spring and summer. 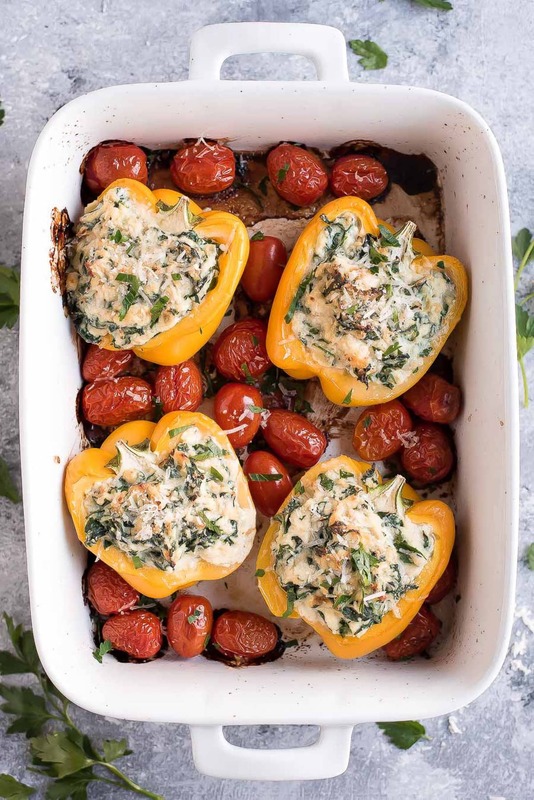 Super easy Stuffed Peppers recipe - full of onions, garlic, spinach, seasoning, ricotta and parmesan cheese, and a grain of your choice! 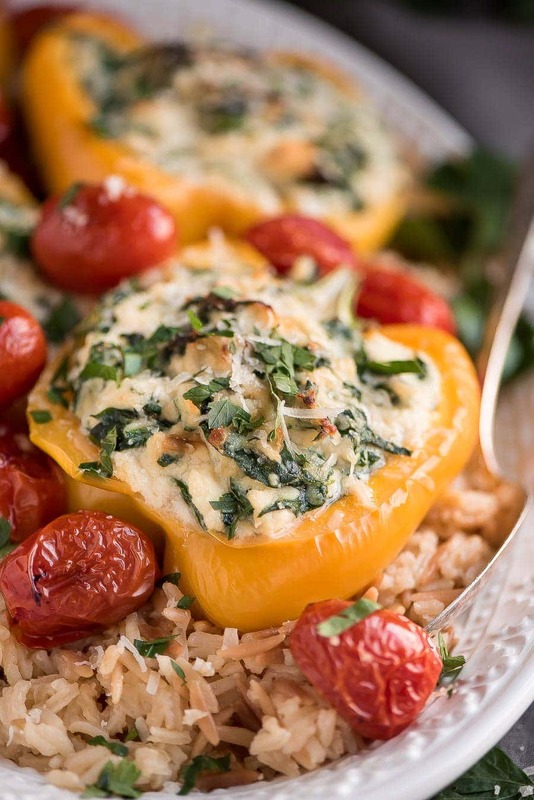 We love to serve our stuffed peppers with rice. 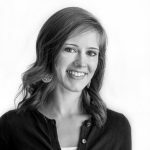 For more amazing recipes by Melanie, definitely head on over to Garnish & Glaze. The tomatoes look absolutely incredible. All it took was a little olive oil and 25-30 minutes in the oven at 425? LOL!! Yep 🙂 Enjoy and thanks so much! Be careful not to use any oils (such as extra virgin olive oil) when cooking the tomatoes. Only use a high temperature cooking oil or your oven will start smoking like mine did! Whoops. Just made these for dinner tonight. They were very yummy! I am so glad you liked them! Thank you for trying them! Could i add shredded chicken to this!? Sure could!! I hope you like it! Let me know how it turns out! Has anyone tried to freeze these for fast meals for later? I’m sorry, I haven’t tried freezing them, yet! Anyone else? I am looking at your recipe for spinach ricotta stuffed peppers. On the recipe it states that you use “spinach, ricotta, and your favorite grain”. On the recipe though it does not say how much of the grain we should add into the mixture. I would love some feedback on this! those look so yummy! I’ve made this a few times and love it! I change it a little by adding ground sausage. It makes it so flavorful. Leftovers are even better. Yum! I am glad you liked them! Thank you for trying them! I’m making this for dinner right now. I didn’t see garlic listed in the ingredients, but I noticed it is mentioned in the instructions. I added 2 cloves of garlic. The house smells amazing! Can’t wait to eat it! Perfect! I need to add it. What did you think? i just made these! They are amazing. I hate stuffed peppers, but these have changed my mind. I added some balsamic vinegar to the pan over the tomatoes. Wonderful easy dish! Will be making these again. Thank you for making me a stuff pepper liker. I love to hear that! Really, you could try what you like. Sausage would be good with the cheese. Thank you for letting me know!